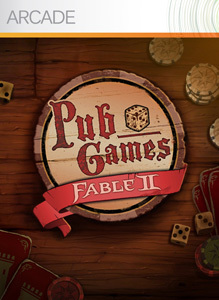 The Deal of The Week this time is for Fable II pub games. Normally priced at 800 points, this week the games will cost 400 points for Xbox Live Gold Members. This week we also get two new arcade games to check out:Inferno Pool, and RAINBOW ISLANDS: TOWERING ADVENTURE! "Unlock the full version of the Fable® II Pub Games and you’ll get all three great pub games that will also be in Fable® II! Each game has multiple variants, plus the ability to earn and transfer gold and unique items to your character in Fable® II (assuming, of course, that you also have Fable® II). Either way, you’ll also get access to minigames, leaderboards, achievements, and all the fun of these backroom games of chance!" "Multiplayer mayhem awaits for up to four local or online players, in a race to clear the most balls from your table in Inferno Pool®. Pot balls to fire at opponents, or stockpile balls to unleash an onslaught. Master Jump Shots, Combos, Bank Shots, Kick Shots, and build your multiplier with an unbroken potting streak to unleash the devastating Inferno Mode." "Rainbow Islands: Towering Adventure! is platform gaming at its most colorful. Control the rainbows to take you through the game's 10 seamlessly connected areas, as you climb from the earth to the far reaches of space. Conquer all 10 Areas in four different game modes, and customize your character's outfit with a range of quirky costumes that you can earn in the game."